We’d love your help. 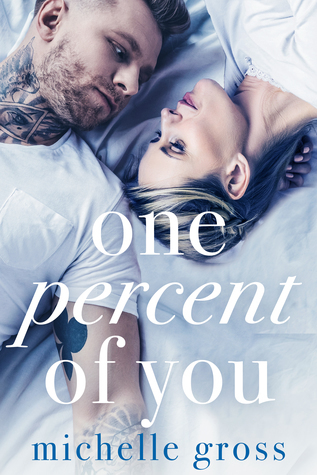 Let us know what’s wrong with this preview of One Percent of You by Michelle Gross. Make no mistakes about it. I know what I look like to others. Young, government-aided, pregnant mom. They see Lucy on my hip, and they see a mistake. I mean, why else would someone have a child so young, right? They couldn’t be more wrong. I’m too busy most days between parenting, work, and finishing up my last year of nursing school to let their judging gaze tear me down Make no mistakes about it. I know what I look like to others. Young, government-aided, pregnant mom. They see Lucy on my hip, and they see a mistake. I mean, why else would someone have a child so young, right? They couldn’t be more wrong. I’m too busy most days between parenting, work, and finishing up my last year of nursing school to let their judging gaze tear me down until he moves in the vacant house next to the apartments I live in. Oh, fudge. I think I’m wrong. Again. To ask other readers questions about One Percent of You, please sign up. A pregnant woman, her daughter, and a cranky new neighbor. There was a moment of panic. For a second, I couldn’t see any Funyuns. I realized why. There was only one bag left, and it was partially hidden by all the Lay’s chips next to it. I nodded and smiled as if to say, “It’s all good” when two little hands shot up and snatched the bag before I could.